From the 1980’s it has been generally recognized that there has been an overall drop in the quality of raw materials in the steel making industry. Coupled with a drive from technology to provide consistently cleaner steels means that producers have had to work on optimizing processes to meet demands. Since the 1980s it can be observed that the quality of raw materials and fuels used for iron and steel making has become continuously worse. As a result this global trend has led to a deteriorating hot metal quality in terms of higher contents of impurities. At the same time steelmakers have been faced with increasing requests to produce clean steel with low and ultra-low content of sulphur and phosphorous in particular. Decreasing availability of premium high quality raw materials and fuels with low contents of unwanted and harmful elements and onwardly increased pressure to lower production cost by purchasing cheap raw materials have led to this doom loop. In the past, generally the Western steelmakers responded to this challenge by optimizing their facilities, improving the degree of automation, introducing bottom stirring in BOF converters, and to say by squeezing the productivity of their aggregates to ever new records. But these efforts have come to an end and further progress can be only attained with alternative concepts. A modern steelworks consists of a series of process steps where crude iron is gradually refined to steel of a certain quality and casted in a continuous manner into large pieces, e.g. rectangular slabs, which are treated further in the rolling mill. The crude iron is produced in the blast furnace by reduction of iron ore. The huge slag generation due to blowing oxygen in the torpedo ladle during dephosphorization and a highly restricted scrap usage ratio, led Nippon Steel’s Nagoya works to modify their BOF converter into a HM pretreatment converter for De-Si, De-P, and DeS. After tapping and separation of the slag the hot metal is then charged to another converter where DeC is executed. 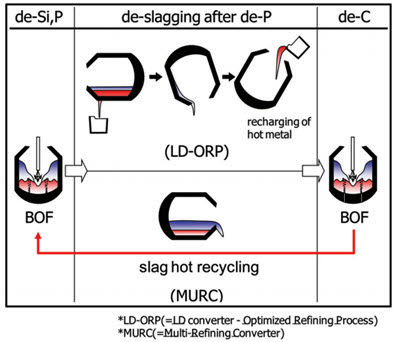 Figure 1 shows the flow diagram of this process, which was named “LD-ORP (LD – Optimized Refining Process)”. In Japan, at Nagoya Works the LD-optimized refining process (LD-ORP) was developed, and began to use it commercially. The process consisted of charging of hot metal into a converter designated exclusively for dephosphorization; removal of Si and P by blowing mainly oxygen gas, taking advantage of the large free board that torpedo ladle cars lacked; removal of S by bottom blowing of flux; deslagging; and transfer to a common converter for decarburization (Figure 1)). Despite the trouble of the transfer from one converter to another, the process has been applied to increasing amount of hot metal in appreciation of low CaO consumption, high yield, and stable and high-speed operation of converters, and it was aimed to be applied to all hot metal. 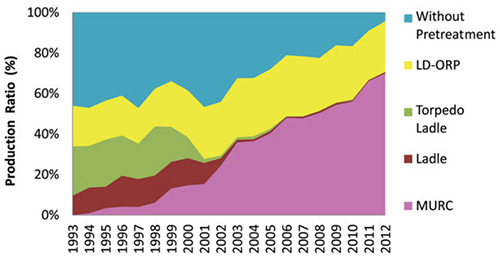 As stated above, hot-metal pretreatment methods taking advantage of converters showed rapid advances since the 1990s, and as a result, the shares of the LD-ORP and MURC processes in hot-metal dephosphorization increased, replacing conventional processes using torpedo ladle cars or hot-metal ladles, as seen in Figure 2. As of the beginning of 2012, the converter dephosphorization methods are responsible for about 95% of the hot-metal dephosphorization of the company; our plan is to make the Figure reach 100% in 2013.